Should Married Couples Combine Their Finances or Keep Money Separate? If you asked a random assortment of couples about the subjects they fight with their significant other over, you’d most likely hear the same things over and over again. A study published in Family Relations that evaluated the diaries of 100 married men and 100 married women for 15 days revealed that the following topics were the most common sources of marital conflict: children, chores, work, leisure, and money. While the study showed that money isn’t the top source of marital or relationship conflict, it’s often the reason couples break up or divorce. 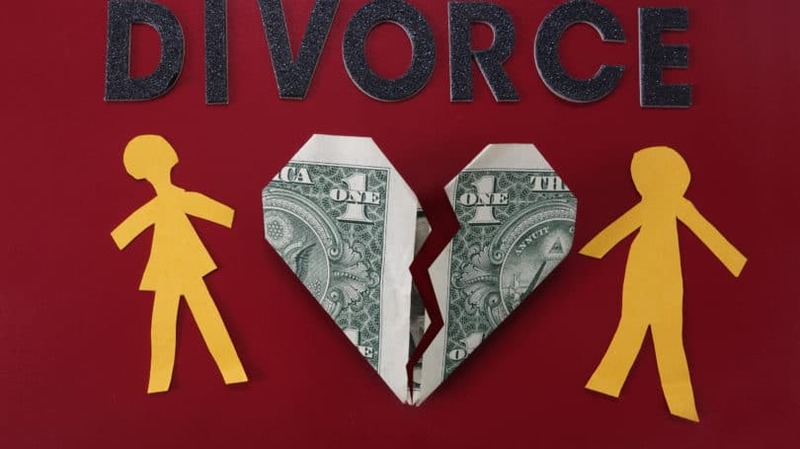 One study, published in the Journal of Divorce & Remarriage, noted that 40% of couples stated that the way one spouse handled money was a cause of their divorce. Money differences can arise because one of you likes to spend while the other prefers to save. You may experience money stress because there isn’t enough money coming in and you’re struggling to make ends meet. If one person earns considerably more than the other, that can also be a source of tension and stress in your relationship. 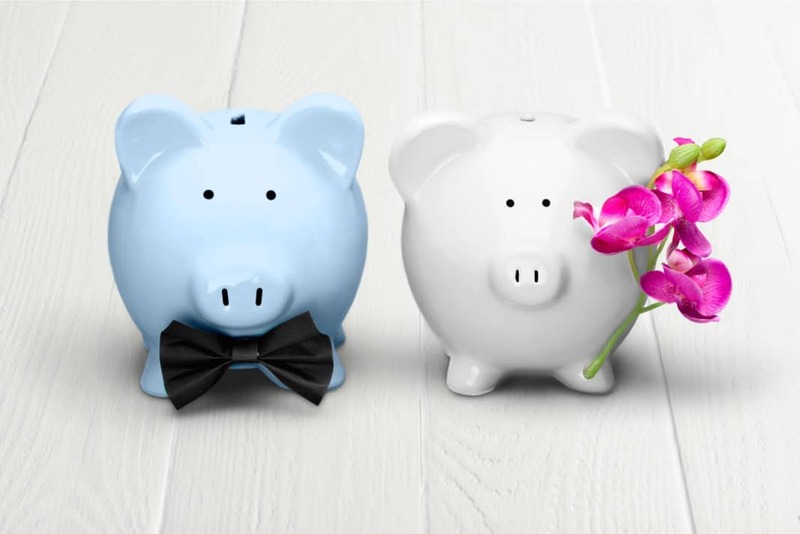 Although it’s not a magic bullet or a way to breakup- or divorce-proof your relationship, deciding early on how you’ll handle your finances as a couple can help prepare you for any future financial challenges. The first thing to do is determine if you want to keep your finances completely separate, join them together, or merge some areas while keeping others separate. If you’re not sure which path to take, examining the pros and cons of each and having an in-depth conversation with your partner can help you choose the method that works best for you as a couple. Times have changed when it comes to couples and finances. As The Atlantic notes, up through the latter part of the 20th century, women were often wholly dependent on their husbands’ income and financial status. Joint finances was a given since, in many relationships, just one person was the income-earner. Today, things are different. Not only do women get to work outside the home and earn their own money, but they’re also, in many cases, likely to earn more than their partners. People are also committing to each other later in life, according to The Atlantic. Although some people still get married at a young age, many wait until they’ve finished undergraduate or graduate school and have built up their careers. These people have started to carve their own financial paths and might find it difficult to blend their money with another person. While keeping finances separate is an option for modern couples, not everyone considers it a good idea. Some wonder if keeping their money separate means that they aren’t willing to fully commit to each other. Here’s a look at the pros and cons of keeping your money separate from your significant other. For couples who merge their finances, it’s common for one person to take on the role of “household manager” or “money manager,” allowing the other person to check out when it comes to the financial side of the relationship. Having one person be the “money person” in a relationship creates inequality and can be a source of conflict later on. If both people are actively maintaining their accounts and keeping track of their income and spending, then it’s less likely that one person will end up blindsided by the other or that one partner won’t even realize when the other drives the couple into debt. It’s likely that you and your significant other have had at least one disagreement about your finances, whether it’s over how much one person spent on (what the other considers) a frivolous item or how much you should spend on groceries or eating out. When you keep your money separate, it’s truly “yours.” If you have the cash to spare and want to use it to buy a designer dress or a new video game system, your partner can’t really complain. Some people aren’t good with money. They might struggle with a gambling or shopping addiction or be deep in debt. While you love your partner, flaws and all, you don’t necessarily want their financial problems to become your problems. If one of you has financial difficulties, keeping your money separate can often be the best way to go. You don’t want to get into debt to fund your partner’s lifestyle. Unless you and your significant other plan on keeping all aspects of your life separate — such as separate houses, grocery bills, and so on — there will be times when you need to bring your money together. Keeping separate bank accounts provides you with the opportunity to share joint expenses more equitably. Instead of pouring everything you make into a shared account, you can agree to divide your shared bills based on your respective incomes. For example, say you’re renting a house or apartment together. Your partner earns twice as much as you. As the higher earner, they can contribute twice the amount you do to the monthly rent. If your rent is $1,500 per month, they can pay $1,000, and you can pay $500. If you own property together, it’s still easy to split your expenses and bills, as well as your shared property, equitably. Let’s say your mortgage is $1,500 per month, and your higher-earning partner pays $1,000 while you contribute $500. Over time, they will have a larger stake in the house. You can keep track of the payments you make and how much principal and interest each person is paying. Should you sell the house later on, you can divide the proceeds from the sale based on how much equity each person has. Few, if any, couples want to think about splitting up, at least not when things are going well in the relationship. But people do break up or get divorced. If you keep your money separate from your partner’s, it can make it easier to make a clean break if the relationship ends. On a similar note, if each person in a relationship remains in control of their money, it can be easier to end things if they become unbearable. No one should have to stay in a dead relationship because they feel they’re financially dependent on their partner. Although keeping your money separate from your significant other’s does make it less likely that you’ll argue over the price of a dress or a new video game system, it’s not a panacea. If one person loves to save and the other loves to spend, the saving or spending habits of the other can still be extremely irritating, even if they’re using their own money. Also, when you maintain separate accounts, one or both of you might not feel as if you’re on the same page financially. If you’re working to save up a down payment for a house, but your partner seems to spend all their money, you’re bound to feel annoyed, alienated, or both. Couples share things, such as household bills or the check at a restaurant. When you keep money separate, you need to come up with a system for paying for those things. If you have a shared account, you can each deposit your paychecks into the account, then pay for your joint expenses without having to do any complicated math. Although some people believe that keeping your finances separate implies that you don’t trust your partner, the opposite is usually true. Having separate accounts requires trust. You’re trusting that your partner isn’t spending all their money on vices or digging themselves deep into debt, and they’re trusting you not to do the same. Unfortunately, keeping your money separate from your significant other’s makes it easier to commit financial infidelity by hiding purchases, debts, and other financial issues you might not want your partner to know about. One way to keep both partners on the same page financially, even if you keep your money separate, is to schedule regular check-ins where you talk about your money goals and budget. Although keeping your money in a separate account from your partner’s can make it more challenging to divide up your shared expenses, it’s not impossible. Here are a few ways you can split the bills when you each have your own money. 50/50. If you both earn about the same amount of money, the quickest and easiest way to share bills is to do a 50/50 split. At the beginning of the month, you can sit down together and divide up your expenses, then determine who will pay what and who owes what to whom. Your Bill, My Bill. Another way to divide your bills is for each person to “claim” certain bills. For example, you can pay the water and sewer bill, and your partner can pay the electric bill. When you go grocery shopping, you can alternate paying at checkout. Income-Based. If one person earns significantly more than the other, going halfsies might not be fair. Another option is to divide your expenses based on how much each person earns. If you bring in three times the salary your partner does, then you should pay three times more toward your joint expenses. Many millennial couples, and some Gen X and baby boomer couples, keep their money separate throughout their relationships, whether they get married or not. But some prefer the idea of creating joint accounts and taking a “what’s mine is yours” approach to their household finances. As with keeping separate accounts, merging your money has its benefits and drawbacks. 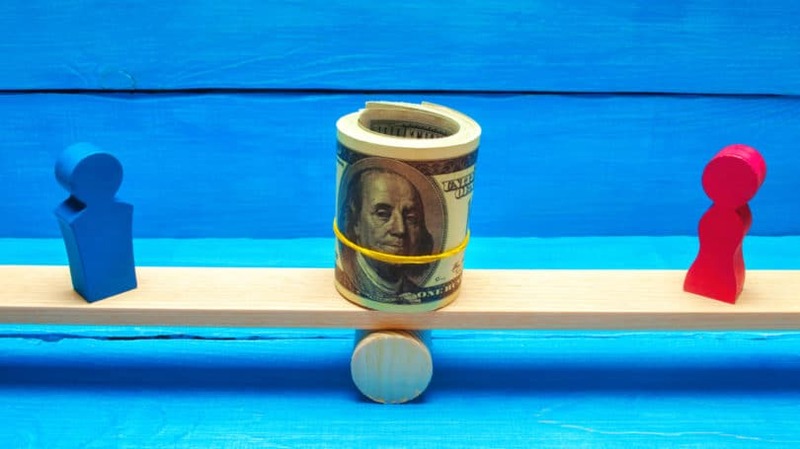 It’s crucial to weigh the pros and cons of combining finances before you decide to do it. I don’t currently share accounts with my partner, but there are times when I can’t help but think it would be nice to have a joint checking account or credit card. That way, when we’re out to eat, we could just plunk down the card and settle the bill, rather than trying to remember whose turn it is to pay. Merging your money not only answers the question of “Who’s paying for dinner?” but it also helps to streamline the process of paying for shared bills. One partner doesn’t have to collect from the other, and you don’t have to do a lot of math to figure out who’s paying what and how much each person owes. Opening joint accounts with your significant other also makes it a lot easier to set shared financial goals and to be on the same page when it comes to your financial hopes and dreams. If your goal is to buy a house together, you can open a shared savings account and decide how much each person will contribute each month. You can also set a target down payment amount and work together to save that amount. While keeping separate accounts helps you maintain some financial independence and autonomy in your relationship, it also makes your partner’s money inaccessible to you. When things are going well and you’re both in good health, that’s not much of a problem. But if your partner should get hurt, become unable to work, or die, you’d lose access to their share of the household contributions. That can make it challenging for you to pay your bills and get by. When both of your names are on an account, you each have equal access to the money in it. When you keep your money separate from each other, it can create the sense that you’re on your own in the world, even if you have a partner on your side. If you want to take a financial risk, such as leaving your job to go back to school or pursuing a different, lower-paying career, you might feel unable to do it. If you share your finances, one partner can “pick up the slack” while the other tries something new. Perhaps the most significant drawback of merging your money with your significant other is that you assume partial responsibility for their poor financial decisions. You might not have had any debt before you started going out with or living with your partner, but when you merge your finances, your money may go toward their debt. If your partner encourages you to take out loans with them or to co-sign a loan with them, and then they don’t pay it back, your credit can take a hit too. It’s also possible for one partner to spend the other into oblivion when you share accounts. Before you join your finances, it’s essential to have a long talk with each other about spending habits, debt preferences, and financial history. Your partner’s video game habit might annoy you, but if they’re spending their own money on it, it’s not that big of a deal. When they’re dipping into your joint account to buy the newest game or purchase yet another gaming system, it’s a different story. There’s a chance that you and your significant other will argue about money more when you share finances, especially if it seems as if one person is spending more on themselves than on joint expenses. One way to keep the arguments in check is to give yourselves personal spending limits. For example, you might each get $250 per month to use however you want; if you want to spend more than that, or you’re hoping to make a big purchase during one month, you need to check in with each other first. When you share a checking account, savings account, and maybe a credit card or two, things can get messy when one or both of you decides the relationship is over. Things can get particularly complicated if you own a home together or have shared debt. One way to ease the stress of a breakup is to create a contract, such as a prenuptial agreement, before you merge your finances. Decide how you’ll divvy things up in the event of a breakup. If you have no plans to get married, you can create a cohabitation agreement. Although you may not want to think about the potential end of a relationship, doing so can make your life a lot less stressful in the long run. It’s also possible to take a hybrid approach to managing your finances with your partner. You don’t have to throw all of your earnings into the same pot or share every single account. Instead, you can open a joint checking account, a joint savings account, and a shared credit card. You can also maintain separate checking accounts and savings accounts for your individual goals or personal spending. If you take this blended approach, it’s essential that you decide how much each person will contribute to the shared accounts and what you can use any shared accounts for. No matter what approach you decide to take when it comes to managing your money with your partner, it’s critical that you follow one rule: Always communicate. That means letting your partner know about your financial background early on the relationship, as well as sharing any financial challenges with them as your relationship grows. It also means being open and honest with each other throughout each phase of your relationship. Even if you keep your money separate, you want to be on the same page when it comes to what you’re doing with your lives and finances. How do you and your partner manage money? Do you think it’s better to blend finances or keep things separate?